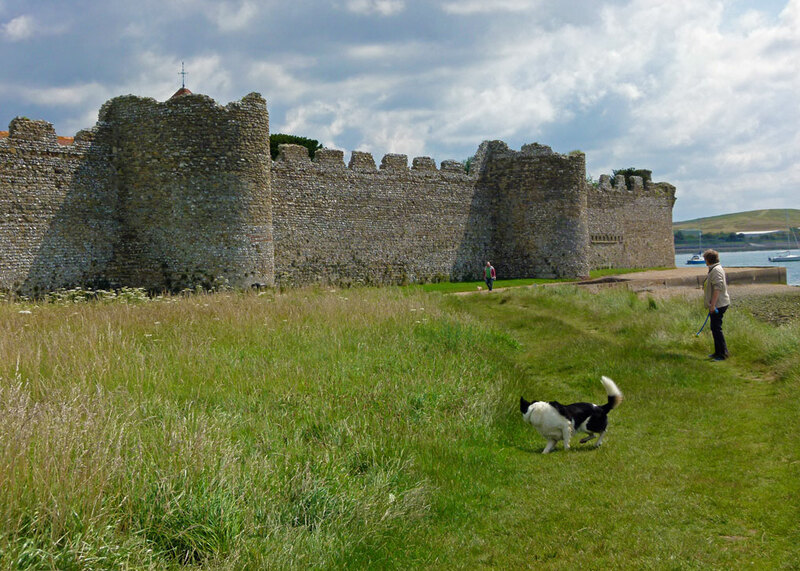 People are walking their dogs around the ancient walls of Portchester Castle. A cricket match is taking place on the green. Some scruffy kids run up and down the ditch outside, whooping. Anglers drape their lines optimistically into Portsmouth Harbour and gaze at passing ships with the old Royal Navy dockyard beyond. It’s a peaceful scene. Take them all away and turn the clock back 1700 years. It is the 3rd century AD and Britain, the most northerly province of the Roman Empire, is under attack. The Romans construct a fort at Portchester, most likely called Portus Adurni, possibly on the site of an earlier settlement. It has a commanding position at the head of a natural harbour, and is one of a chain of nine coastal forts strategically placed from Norfolk to Hampshire to defend the Saxon Shore from Germanic raiders. This part of the Empire was under the military command of the Count of the Saxon Shore. But, 200 years later, Roman rule had gone. And, ultimately, the ancestors of those German raiders settled this part of what is now south east England. We don’t know what happened at Portchester during those troubled years. Probably, it was occupied by a local leader during the later Saxon period. The place has had a chequered history, at various times falling into disrepair; but the impressive walls of the original fort remain as the most complete Roman walls in northern Europe. 700 years or so after the Romans, the Normans built a castle inside the fort. 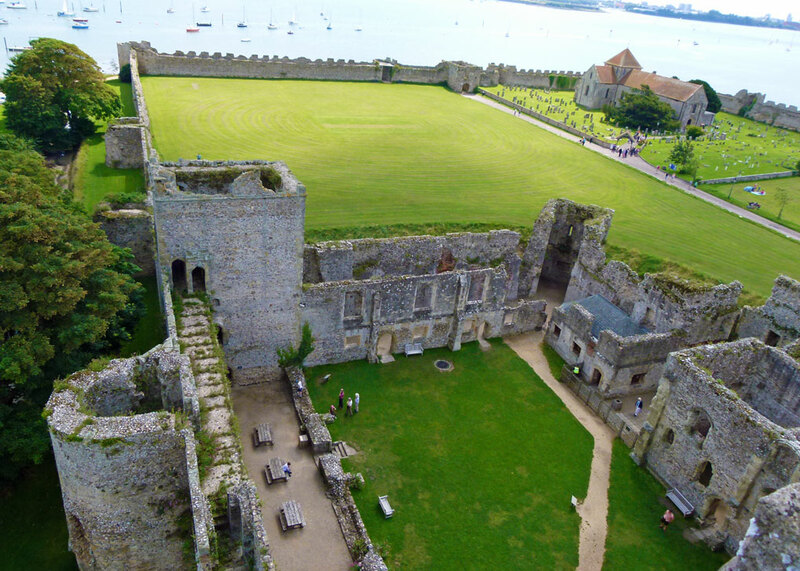 King John was a frequent visitor to Portchester Castle and used it as a royal pad when hunting in the nearby Forest of Bere. It was captured, briefly, by the French in 1216 and re-taken the following year. A century later, in anticipation of further French attacks, it was extensively repaired during the reign of Edward II. 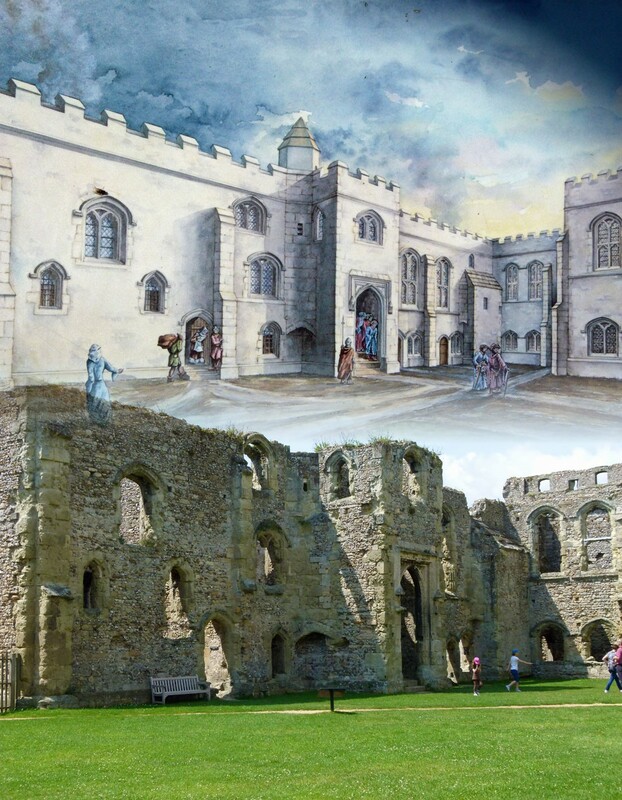 Richard II built a palace inside its walls. 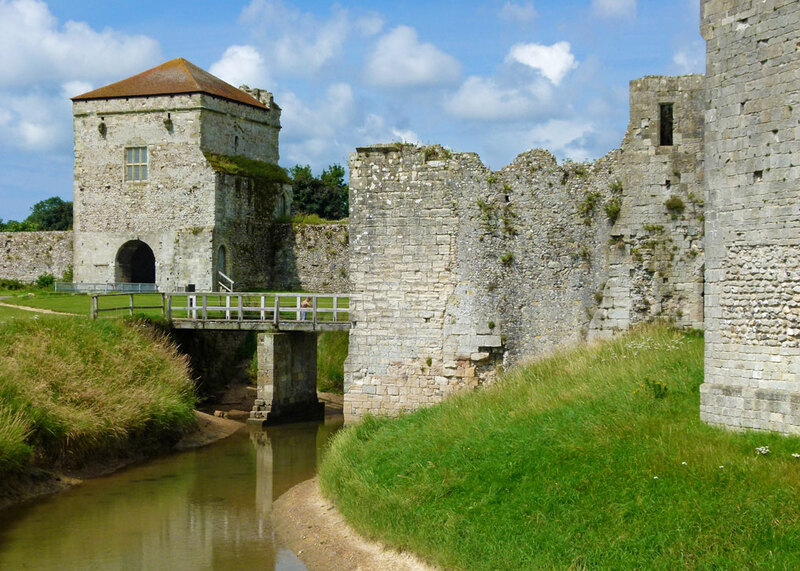 Portchester Castle was the assembly point for English military expeditions to France, including the campaigns of Edward III which led to the Battle of Crecy (1346) and Henry V’s invasion which led to the Battle of Agincourt in 1415 and, ultimately, the Treaty of Troyes in 1420. The importance of Portchester declined during the 15th century as the town of Portsmouth, 6 miles to the south east, grew into one of England’s preeminent naval bases. The Castle was subsequently used as a hospital and a prison during the wars with Holland and France. In 1760, more than 3,000 people were held captive at Portchester. During the Napoleonic Wars, some 7,000 French prisoners of war were incarcerated inside the Castle’s keep and these poor souls have left much evidence of their experience of British hospitality – including wall paintings and graffiti. Apparently, the bones of those that died and were buried in the nearby mud-flats occasionally surface in the ebbing tide. Needless to say, the place is haunted – allegedly – but by a horse that gallops, riderless, across the castle before disappearing into the walls. St Mary’s church stands inside the castle. Built in 1120, it was originally part of an Augustinian priory. Almost all that the monks have left to see is – and children will love this – the chutes from their lavatories, built into the Roman walls. During the early 19th century, part of the keep was used as a theatre and there are some interesting wall paintings from this period. 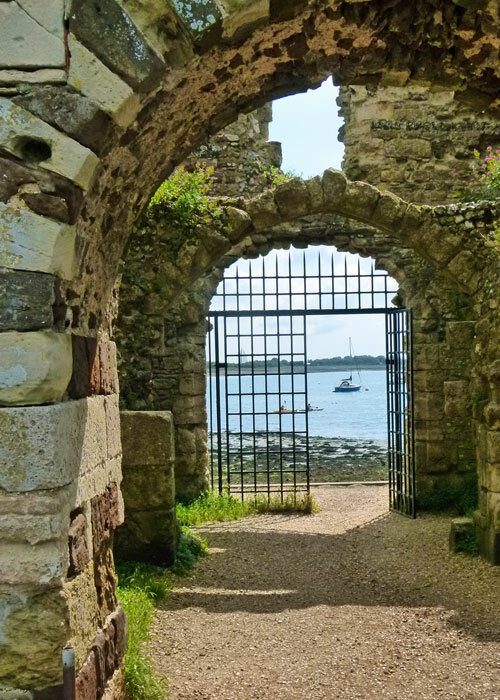 You’ll find Portchester Castle at the end of the originally named Castle Street, passing through the village of Portchester with its charming 18th and 19th century buildings. To get there, take the infinitely less attractive A27 between Portsmouth and Fareham and follow the sign from a small traffic roundabout. Bring a picnic, your dog, fishing rod – or cricket bat. Finally and incidentally, neighbouring Portchester to the east is Paulsgrove, a large residential area that was developed to help solve Portsmouth’s housing crisis in the wake of World War Two bombing. There’s an unlikely local tradition that it got its name because St Paul landed there; it was Palsgrove in the 19th century. As far as prisons go, it’s a nice one, though I’m sure former prisoners wouldn’t agree with me. Well, we did get to Portsmouth, but didn’t see the castle. Really enjoyed the B&B right down on the harbour. Old Portsmouth is the best bit – though Southsea is nice. I’m amazed at the age of the structures which can be found in your country. So that’s another one on the ‘to visit’ list. I think I’ll have to start planning next year’s holidays on the south coast. Great potted history of the castle. Just a 30 minute drive along the M27 for us, yet we haven’t visited for years. Your photo’s compliment your words so well. Great read – thank you. Great photos and history. It looks like a lovely spot to pass some time and explore. 7000 prisoners, that is a lot. You have to think about that number and how it must have been for them. I would find a visit here fascinating.